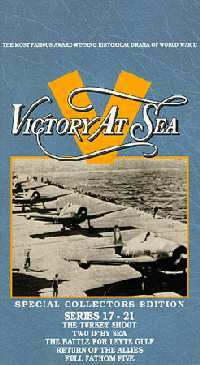 NBC telecast Victory at Sea in 26 weekly episodes from October 1952 to May 1953. This landmark documentary series covering the naval history of World War II received several major awards, including Emmy, Sylvania, and Peabody Awards. The documentary's score by renowned American composer Richard Rogers became a best-selling record. Most of the archival footage came from the U.S. Navy, but the series also used film from Japanese, British, and German sources. Two episodes, "Return of the Allies: Liberation of the Philippines" (#20) and "Suicide for Glory: Okinawa" (#25), cover the history of Japan's kamikaze attacks on Allied ships. The time spent on kamikaze attacks in the Philippines and in Okinawa lacks proper balance. Episode 19, "The Battle for Leyte Gulf," makes no mention of kamikaze attacks, even though they were employed there first. Episode 20 on the liberation of the Philippines includes only one minute on Japanese kamikaze attacks in the Lingayen Gulf in January 1945, two months after the attacks started. The kamikazes sunk 24 ships and severely damaged 67 others in the Philippines (Rice 2000, 80), but the series does not mention this. On the other hand, almost the entire 25 minutes of Episode 25 on Okinawa deals with kamikaze operations. The video's score, while stunning music, dominates the narrative for long stretches at a time. The narrator will frequently not be heard at all for over a minute or two while only the music tells the story shown in the carefully selected, well-organized film clips. As a result, very little history actually gets told in the sections on Japan's kamikaze operations, with the narrator not mentioning specific dates, ship names, and Japanese sortie bases. Other than "desperation and despair," the film gives no explanation as to why the kamikaze pilots attacked American ships and why the Japanese military leaders decided to make suicide attacks. The narration in places tends to be overdramatic, sometimes almost sounding close to American wartime propaganda. The documentary's film clips focus on the American side, but Episode 25 does show a couple minutes of Japanese footage of pilots before takeoff and kamikaze planes taking off. One suspicious clip shows a Japanese pilot getting into a plane with "KAMIKAZE" painted in capital letters next to a Japanese flag on the side of the plane. Other documentaries do not show such a wartime clip, and I have never seen any still photos where a Japanese wartime plane has a word on its side in English letters rather than Japanese characters. Although Episode 25 shows spectacular kamikaze crashes, flaming planes hitting the sea, and devastating damage after the attacks, it is doubtful that all of these film clips relate to kamikaze attacks. The film never tries to describe the action shown in a specific clip, so it is nearly impossible to determine what specifically is being shown on the screen. Also, since Japan used conventional bombers on the same dates as kamikaze planes, the Americans many times may have not been able to tell the difference if they shot a plane down prior to reaching a ship. This World War II documentary series has much merit for its extensive archival footage, wonderful music score, and broad scope, but the sections on Japanese kamikaze operations do not provide any historical understanding other than images of the attacks themselves and the damage inflicted on Allied ships. Rice, Earle, Jr. 2000. Kamikazes. San Diego: Lucent Books.